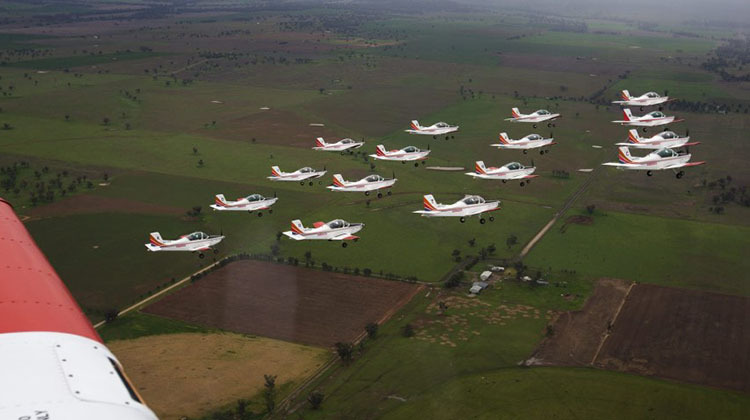 A formation flight of 16 CT-4B Airtrainers on July 12 2016 marked 250,000 flying hours by the type with the BAE Systems Australia-operated BFTS. BAE Systems Australia has announced that it will lease part of its Flight Training Tamworth facility to CAE Oxford Aviation Academy Melbourne for commercial pilot training. CAE Oxford Aviation Academy is looking to expand its business from 2018 onwards to meet future training demand. BAE Systems will continue to deliver military training services to its current customers – the Australian Defence Force, Republic of Singapore Air Force, Royal Brunei Air Force and the Papua New Guinea Defence Force – as contracted until December 2019. “We are working collaboratively with local community leaders to consider options for the site that will maximise the use of the facilities,” BAE Systems Australia chief executive Glynn Phillips said in a statement on Tuesday. BAE Systems has operated the ADF’s Basic Flying Training School (BFTS) at Tamworth since 1999, however under Project AIR 5428 initial pilot training for all three arms of the Defence Force is being relocated to RAAF Base East Sale. Good to see someone recognising the great flying environment around Tamworth. BFTS move to the regularly weather effected East Sale was purely political.